In the summertime, the air is thick with the low humming of bees delivering pollen from one flower to the next. If you listen closely, a louder buzz may catch your ear. This sound is the key to a secret stash of pollen that some flowers hide deep within their anthers, the male parts of the plant. Only pollinators that buzz in just the right way can vibrate tiny grains out of minuscule holes at the top of the anthers for a protein-rich snack. The strategy, called buzz-pollination, is risky. But it’s also critical to human agriculture. Tomatoes, potatoes and eggplants need wild populations of buzz pollinators, such as bumblebees, to produce fruit. Honeybees can’t do it. Plants need a way to get the pollen — basically sperm — to the female parts of another flower. 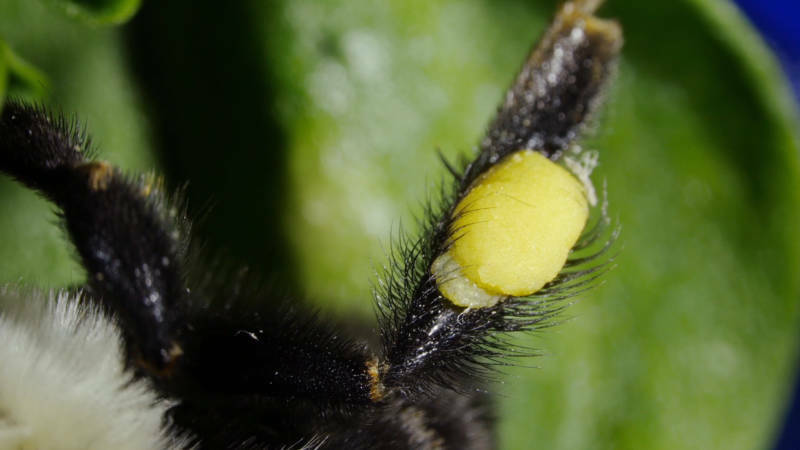 Most plants lure animal pollinators to spread these male gametes by producing sugary nectar. The bee laps up the sweet reward, is dusted with pollen and passively delivers it to the next bloom. In contrast, buzz-pollinated flowers encourage bees to eat the pollen directly and hope some grains will make it to another flower. The evolutionary strategy is baffling to scientists. Bumblebees forage for two food sources: nectar for a quick sugar rush to power their flights and pollen for protein. Most buzz-pollinated flowers are specialists that only offer pollen and they hide the grains at the bottom of tall, skinny anthers. The bee bites down at the base of the anther, leaving little marks called bee kisses. She "unhooks" her flying muscles from her wings so she can contract them without taking flight. Then she begins to vibrate violently, a behavior scientists call sonication. 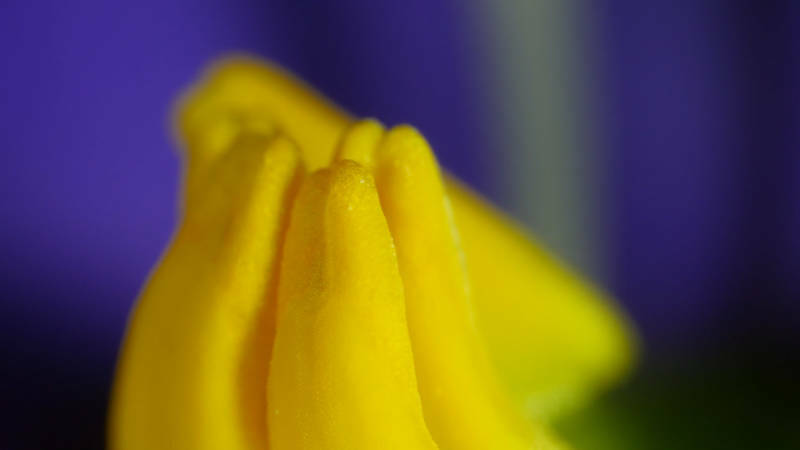 The vibrations travel through her soft body to the flower and shake up the pollen grains trapped inside anthers. When she buzzes hard enough, the pollen shoots out of the top and covers the bee. The bumblebee grooms herself, combing the pollen down and mixing it with saliva. She stores the pollen in sacs stuck to her legs as she makes her rounds. Buzz pollination is an unlikely evolutionary strategy because the plants are banking on bees working extra hard for a modest reward. Despite the risk of being ignored, buzz pollination has popped up in 20,000 flowering plants across a smattering of unrelated species. Leonard and her team are investigating what the strategy is all about. What are the evolutionary pressures that led so many buzz-pollinated plants to lose their nectar and to specialize in pollen? How do pollinators forage for pollen? Leonard and her graduate student Jacob Francis search for answers from the bee’s point of view. They dosed fake flowers with different amounts of sugar water to see if the bee works harder to get pollen and nectar. To measure the bee’s effort, Francis rigged a mini-accelerometer to the base of the flowers with some structural wax, the kind you put on braces as a lip protectant. “If the plant also offers nectar, for example, are the bees on a sugar high and buzz more vigorously?” asks Francis. Does this extra “buzz-thusiasm,” as he calls it, remove too much pollen and actually harm the plant? Previous research shows that the harder the bee buzzes, the more pollen it gets. The flower could be selecting for the bigger stronger buzzers that can fly longer distances and spread the flower’s genes farther. The bee may be willing to put in the extra work because the buzz technique reduces competition — even honeybees are barred from access. You may never have heard of buzz pollination, but chances are you’ve enjoyed blueberries, cranberries and peppers — just a few of the many crops that require a healthy population of wild bumblebees and other buzz-pollinators to produce fruit. 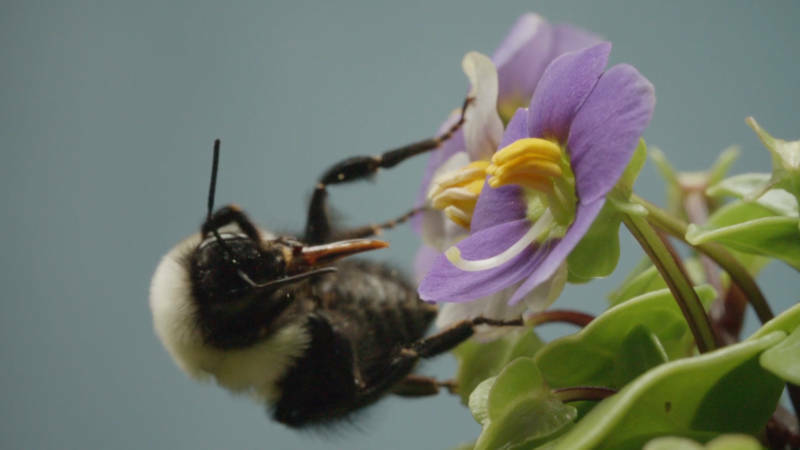 Not only do these bees help buzz-pollinated plants, research shows that the presence of wild bumblebees improves the success of honeybee-managed crops. Despite their importance to human agriculture, we are just beginning to understand what makes buzz-pollinators tick. Wild bumblebee populations are in wide decline partially because humans are messing with their pollen sources by replacing habitats with gardens or agricultural fields, Leonard says. She hopes her research will help reveal what will keep bee populations healthy.